Hello ... Hello ... my old friends ... It's great to see you once again! There's an important deadline approaching this weekend when Sunday 18th slips into Monday 19th September at "Midnight Blue". 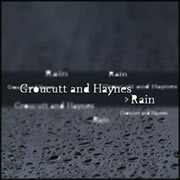 That's the time when you will no longer be able to vote for the superb song "Rain" as written, produced and performed by Groucutt & Haynes in the YouBloom 2011 Music Awards, a competition wherein the winner will walk away with a £10,000 prize.